This entry was posted in Agile, Campaign4Change, Capgemini, change management, CIO, excessive secrecy, Government IT, HMRC, HP, IBM, Infrastructure and Projects Authority, IT-related failures, Legacy ICT, National Audit Office, npfit, project management, public sector, public services, risk, software quality, supplier relationships, Universal Credit. Bookmark the permalink. Thank you, Tony, for this update on such a worrying topic. 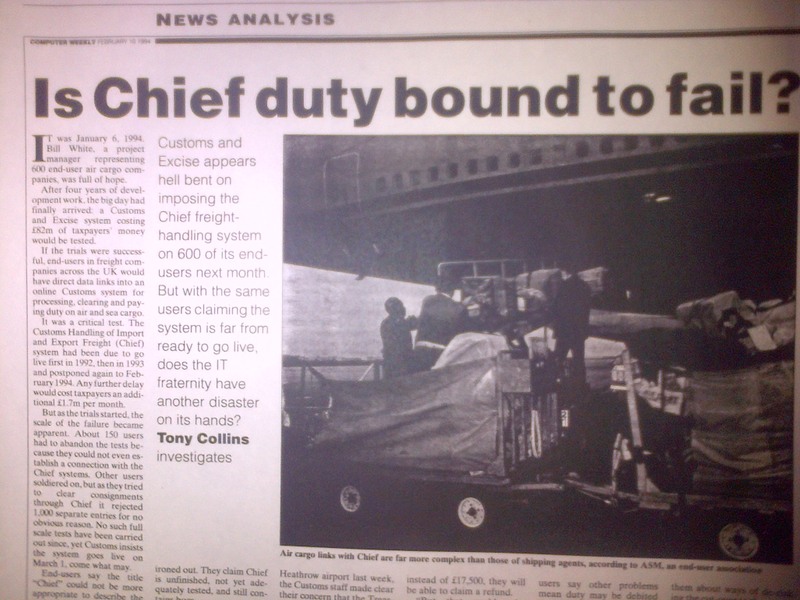 However, I am very pleased that the FT quoted you as calling for an independent review of the new customs system. With the best will in the world, it will have teething problems, and nothing to be ashamed of in that. But, we should try to address and thus minimize such problems instead of pretending that they do not and will not exist. I won’t repeat what I’ve said before about our institutions occupying self-serving and comforting echo chambers – again that is a weakness we all tend to have. But, the present state of our civil and political society would seem to encourage paralysis rather than deep and honest analysis followed by data-driven action. If I had a red petticoat, I would whip it off and wave it in front of the oncoming train but, in the absence of such, I will be stocking up on tins, dried foods, and useful provisions. Thanks again and a very Happy New Year to you and yours. IBM used their Indian subsidiary to configure SAP for Somerset County Council back in 2009. In 2007, they formed a joint venture 75% owned by IBM called Southwest One. Savings of £180m were predicted in 2007 but after 9 years Somerset County Council had lost £69m (over and above the modest savings made) and the contract was terminated 1 year early. That SAP configuration then had a hiatus period of several years of duplicate payments and a backlog of unrecovered debts and following an independent IT audit was formally described as “poorly configured”. I read recently that under cost pressures that IBM has offshored even more of their technical support division overseas to distant India. Looking at IBM’s record in DEFRA (rural farm payments) and here in Somerset with SAP then I will be totally unsurprised if the delivered IT system for HMRC turns out to be late, over budget and “poorly configured”. Let’s hope that the EU will allow extensions to the transition period! Given the mix of packages and bespoke IT together with a complex supplier chain then I doubt that IBM will be liable for any taxpayer costs or losses in HMRC (they weren’t held to account in Somerset). Thank you for the comment David.